The National Ballet of Canada’s annual production of The Nutcracker is a festive and fun way to get into the Christmas spirit. Going to see The Nutcracker at the Four Seasons Centre has become one of my favourite Christmas traditions, next to watching Little Women on Christmas Eve (sacred in our house). There is something so magical about Tchaikovsky’s suite, and this grand holiday spectacle. I look forward to it every year, and I still get chills each time. The opening scene, a Christmas party, with all the aunts, uncles, and cousins spilling in for a visit is such a familiar scene. In my head, this is how we all arrive on Christmas Eve, dressed up and synchronized, but we end up looking more like a pack of Griswolds in Christmas Vacation. This year, the show only runs from December 13th to January 3rd – only three weeks! I wish they would start on December 1st or so, three weeks isn’t long enough. I know that these shows do a short run time to ensure a packed house each night, limiting the supply to a high-demand market like Toronto. But, would it really hurt to extend by two weeks? If there were empty seats, there would be more room for Dance Break and Rush seats, and they would be able to reach a wider audience who may not have had the opportunity to see the show otherwise. 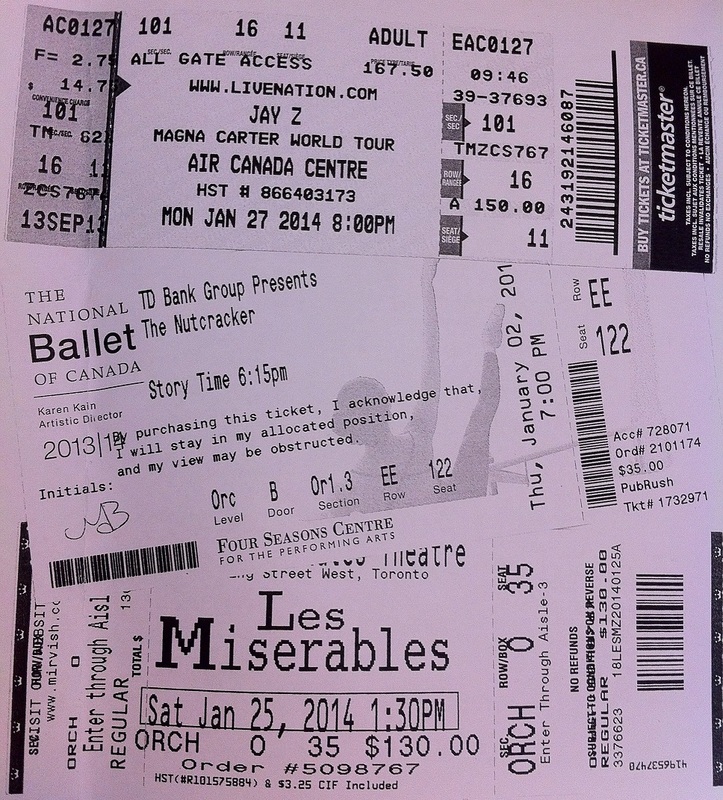 I read that 40 per cent of a ballet company’s revenues are generated during the Nutcracker season. Wouldn’t it be better to extend the run to increase the revenues? And, I think it would be beneficial to extend the run for another two weeks so they can increase the number of future patrons who may never have had the chance to see the show during the regular short run. The National Ballet of Canada does a Russian-style show. The opening scene takes place in a snowy barn and everyone is bundled up. It has been in this style for some time now. My friend, Kate, who bravely faced the box office line in the morning, told me that she has seen a Canadian-style production with dancing Mounties and Canada Geese! How fantastic would that be? While I do love this beautiful, red and gold, Fabergé egg style, I would really love to see something new. Surely, it must be about time for a change. But, it’s not as if they can just re-design and re-choreograph the whole thing. Or, can they? 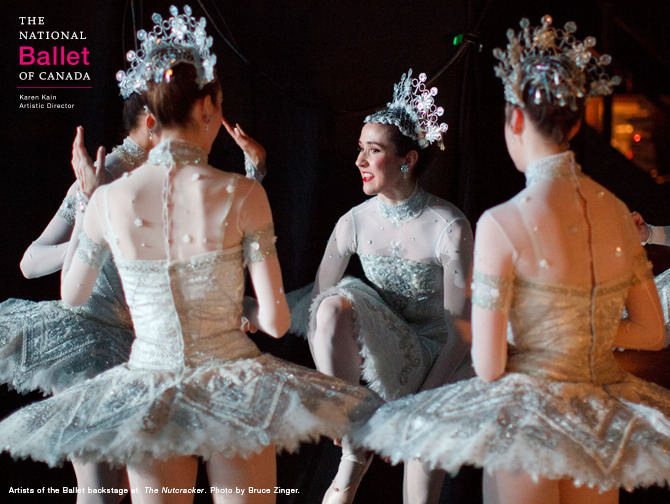 There are so many lovely, familiar numbers in the Nutcracker. That feeling of awe when the tree grows in front of your eyes, the Waltz of the Snowflakes, the Arabian Dance, the Shepherdess and the Fox, and the Bumblebee. I especially love the Dancing Bears. The NBC released this cute video with some rehearsal footage. I always loved how they look so graceful despite their large size and clumsy footwork. The company does a great job of including all ages and skill levels in each number. The little lambs are so cute! They brought them down into the hall during intermission for photos. I’ll never forget my first show, I was so impressed that they brought a real horse on stage! You can imagine my shock when I saw how well the horse was trained, especially when it started dancing around to the music! I didn’t realize until the very end that it was simply two male dancers in a very realistic horse costume. I have said before, the Waltz of the Snowflakes is my favourite number of the whole show. I just love the corps de ballet. They are strong but graceful, beautiful, and synchronized. I’ve learned so much about the different levels in a ballet company thanks to the city.ballet. series on AOL. It’s a very entertaining behind-the-scenes look at the New York City Ballet. Definitely check it out! I think the Nutcracker is such a hit, with me anyway, because it shows me exactly what I want to see during the holidays: heartwarming scenes of family, charming Christmas spirit, beautiful costumes and scenery, and a fantastically talented orchestra accompaniment. I’ve had seats in the past overlooking the orchestra and it is so fascinating to see the musicians live. They are tremendously talented. If you have not yet seen The Nutcracker, it is well worth the trip. If you’re in Toronto, ticket prices range from $60 to $160, but definitely see if you can take advantage of some of their discount programs: Dance Break or Rush tickets (you can usually snag a seat for around $40). Or, you can watch the Mariinsky performance of The Nutcracker on YouTube here. The Nutcracker will really take your Christmas spirit to the next level. With just one more day to go (!!!! ), and my Christmas shopping still not finished – I’m halfway between bliss and stress! I should be very thankful, however, because at this time last year, our whole city was covered in ice, and our power was out for THREE DAYS. Cheers to you, wishing you a very Merry Christmas and a safe and healthy New Year! !